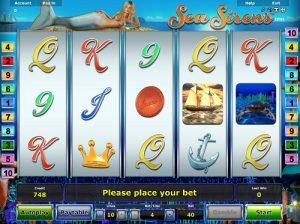 Play Sea Sirens slot game here at NovomaticCasino.co.uk and journey under the water to see if you can find some sunken treasure! This lucrative slot game is filled with beautiful underwater symbols as well as classic slots symbols. It’s a player favourite amongst many of our players and is perfect for beginners and well-seasoned slots players alike. It’s filled with familiar features, such as gamble, autoplay and free spins! Don’t miss your chance to win big with Sea Sirens slot game. Fans of our other games, such as: Dolphin’s Pearl Deluxe, Mermaid’s Pearl, Red Lady and Lucky Lady’s Charm Deluxe will really enjoy this slot game. The lower-paying symbols are the card value symbols from 9 through to the Ace. Then there are some lovely, higher-paying themed-symbols, including: the Sea Sirens coin, a golden crown, an anchor, a sailing ship, a crab, a beautiful mermaid and a pearl in a shell! To get a payout, you’ll need to spin at least two or three symbols (depending on the symbol) and they’ll need to fall on an active winline on consecutive reels from left to right. Each payout will depend on the size of your bet and how high-paying the symbol is. You can check the paytable to see how much each combination of symbols will pay you, according to your bet, and you can then change your bet by using the plus and minus symbols to increase or decrease the number of lines you’re betting on as well as the amount you’re betting per line. The minimum bet in Sea Sirens is 0.04. Every time you spin a winning combination of symbols and you get a payout, you can choose to collect it or gamble it. If you choose to gamble it, you’ll need to guess which colour you think the next card will be. If you guess correctly, you’ll double your win with another chance to double it again! If you guess incorrectly, you’ll be back to the reels without your win! The only time you won’t be able to gamble your wins is if you’re playing in autoplay mode. In autoplay mode, the reels will spin themselves for you automatically without you having to lift a finger! In autoplay mode, you won’t be able to change your bet either, until you exit autoplay mode. Like many other Novomatic games, you can play them for free here at NovomaticCasino.co.uk until you’re ready to play for real and win some real cash! In Sea Sirens slot game, you can win free games! Whenever you spin three of the pearl in the shell symbols, you’ll trigger 15 free games! During these free games, all of your wins will be multiplied by 3 with the x3 multiplier! How’s that for generous? Play Sea Sirens and see if you can dive and find those pearls! Here at NovomaticCasino.co.uk, we don’t just have Novomatic slots, we also have table games and live casino games! The live casino games are fantastic and they’re the most realistic games you can play online because they can give you an authentic, live, real casino experience! Play in real time and not just with a computer program! Choose between: Live Poker, Live Blackjack, Live Baccarat and Live Roulette. Trust us, you’ll love the real feeling and you won’t even have to get dressed if you don’t want to!